Even if you haven’t moved on to the 3rd step, we will guide you through this post on how to accomplish that with least amount of effort required. After creating your shop on your Facebook page, you would need to make some engaging posts on your Facebook page first. This is what captures the interest of your visitors and similarly gets those engagement metrics high. If you already have a BigCommerce store, it becomes easy for you, but if not, we’d want you to setup your store and complete the process – selecting theme, setting up payment gateway, importing products and entering all the required product attributes for every products. Quick note on the product attributes: These are one of the main factors for conversion so, choose your options wisely. Now, In order to list all your products on the Facebook page, you could either use the BigCommerce’s Sell on Amazon app or you could use ExportFeed to get more flexibility in optimizing your products for Facebook. Here, we’ll discuss the ways to grow the sales of your BigCommerce product through Facebook using ExportFeed app. Login to your BigCommerce and add ExportFeed from the app store. This way you will be connecting the product information of your BigCommerce store with ExportFeed cloud. Give some time and you can start creating your product catalog for Facebook from within BigCommerce. If you want, you can also login to your account on the ExportFeed cloud and add Facebook as the sales channel you want to connect your BigCommerce shop with. After completing the integration of your BigCommerce with ExportFeed, it is fairly simple to create your product catalog for Facebook business. Just follow along with the simple steps and after you generate the product feed URL, simply add it to the catalog on your Facebook business manager. Though the products may need up to 48 hours to get approval on your Facebook shop, your products will start showing up within 2-3 hours. But, this also depends upon the number of products that you have included in your catalog. This part is more of Facebook page promotion than Facebook shop promotion. But it is important because that’s how the algorithm of Facebook works. Your posts will only be visible to those people who regularly interact with your page. You may increase the likes on your Facebook page by using the regular ads offered by Facebook. This way, you’ll get what you pay for. But, if you are using the paid methods, you need to make sure that the promotions of your page should be conservative. Meaning, you need to make sure that your promotion efforts targets exactly the group of people who are potentially the customers of your shop. Next way is to invite your friends and families to like your page and request them to share your posts to reach more audiences. This is a good idea as you don’t increase your ad budget but it is also a flawed idea as your friends and families aren’t always your customers. However, if you are allocating your advertisement budget, why miss the free likes and engagements? Content marketing is always useful and blogging is definitely one way to do it right 😉 When you post an article on your BigCommerce store, it should go to your Facebook page immediately. You can use this as a tool to make announcements. Add a new product to your store, create a discount offer, host a contest, or perform a product review – you can always make a blog post about these and post the link to your page. Apart from that, since Facebook is huge on video posts. If you are able to create video posts of your products that’ll increase the engagements for your page. Furthermore, it can be a great idea if you perform a product review with a live video on Facebook. These videos will still remain as Facebook video posts and increase the credibility of your shop. Heads Up! As it happens, every new business is intrigued by the thought of a NEW SALE. With this drive, making every Facebook post a sales pitch is an engagement + goodwill + conversion killer. Alike the good practice of posting images on Facebook while maintaining 25 character title and not more than 20% text, make sure that your page gives 80% infotainment and only 20% of the sales push. With high engagements on your page, your product views and visitors on your BigCommerce site also increases. This is when you apply the trick to conduct remarketing to your visitors. Let your products loose after the visitors of your site through the cookies – remarketing. Your BigCommerce product feed created using BigCommerce ExportFeed app can help you get back the interest of your visitors on the products to help conversion and increase the sales of your products. And if you need any help regarding selling your BigCommerce products on Facebook, our support team is always excited to help you. BigCommerce is a hosted platform and we’ve offered our Cloud Service to help control your resource requirements. ExportFeed allows you to create BigCommerce to Facebook product catalog which is easily accepted without any errors. You can optimize your Facebook product listing by using the product customization options provided by ExportFeed. Map your BigCommerce product category with Facebook categories to create better user experience for your Facebook shoppers. 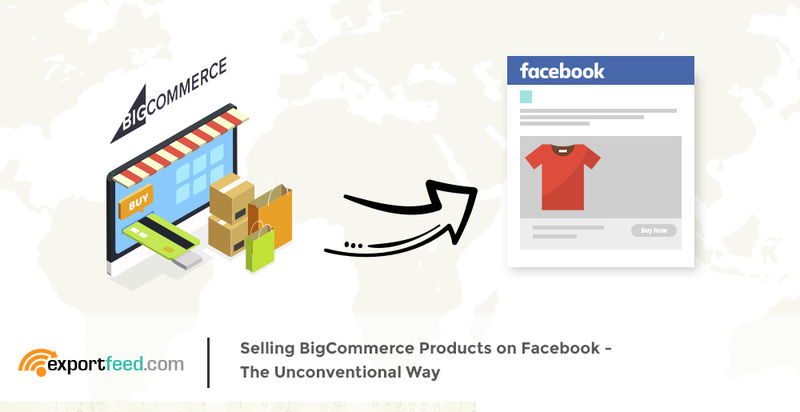 Sell your products from BigCommerce to Facebook!